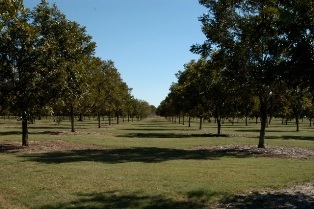 Pecan trees and most other fruit trees can be grown organically with great success. In fact, it is the only logical way to go. Pecan trees and other fruit trees should never have bare soil in the root zone, but should always be covered with shredded native mulches and/or native grasses and legumes. 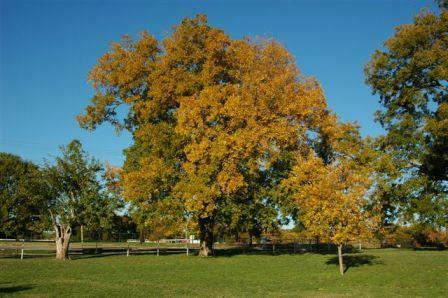 Trees should be planted high with natural organic techniques so that the trunk flares are dramatically above ground. Exposing the flares properly is the most important first step. Trees that are not exposed properly will respond remarkably to the removal of excessive mulch and soil. Round #1 February/March: Mechanically aerate root zone or liquid aerate with 2% hydrogen peroxide and apply organic fertilizer @ 20 lbs. per 1,000 square feet., whole ground cornmeal at 20 lbs. per 1,000 square feet, dry molasses or sorghum @ 20 lbs. per 1,000 square feet, and zeolite at 40 lbs. per 1,000 square feet. Round #2 June: Organic fertilizer @ 10 lbs. per 1,000 square feet and greensand @ 40 lbs. per 1,000 square feet. Use soft rock phosphate or other rock minerals such as Azomite at 40 lbs. per 1000 square feet. Round #3 September: Organic fertilizer @ 10 lbs. per 1,000 square feet. and sul-po-mag @ 20 lbs. per 1,000 square feet. Clean wood charcoal or biochar can also be used. See Terra Petra on DirtDoctor.com. 1st spraying (at pink bud stage): Spray Garrett Juice and BioWash and drench Garrett Juice and Lawn & Garden Select Bio-S.I. If Garrett Juice Pro is used, adding the extra microbes is unnecessary. 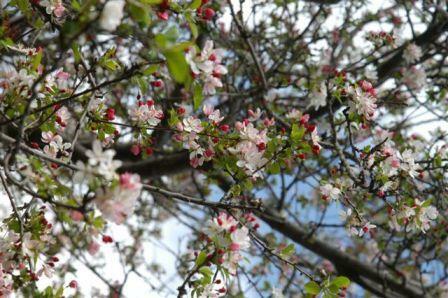 2nd spraying: Use the same mixtures again after flowers have fallen. For best results, spray every two weeks after this point, but at least once a month. 3rd spraying: About June 15th but later in northern locations. 4th spraying: Last week in August through mid-September. Use additional sprayings as need, time and budget allow. Note: If other quality organic sprays are used, make sure apple cider vinegar is included at one ounce per gallon. 1) Apply dry molasses or sorghum at 20 lbs. per 1,000 square feet. 2) Spray Garrett Juice and Bio-S.I. every 30-90 days. Very little pruning is needed or recommended. Maintain cover crops and/or natural mulch under the trees year round. 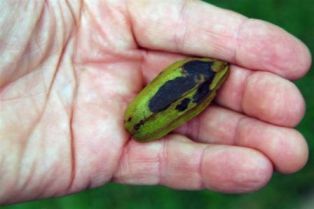 Never cultivate the soil under pecan and fruit trees. 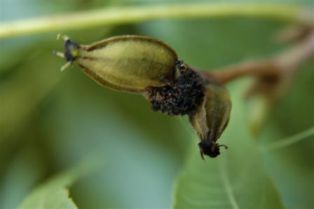 Trichogramma wasps: Weekly releases of 10,000 - 20,000 eggs per acre or residential lot starting at bud break for 3 weeks. Beneficial Nematodes at leaf emergence: Apply 12 million nematodes with 20 gallons of water per 10,000 square feet. More information can be found at ARBICO-Organics. Green lacewings: Release at 4,000 eggs per acre or residential lot weekly for one month.